Taking with the President. Among them ship captain Sergey Zybko, Minister of Transport Sokolov and Novatek owner Mikhelson. Photo: screenshot from Kremlin.ru video. 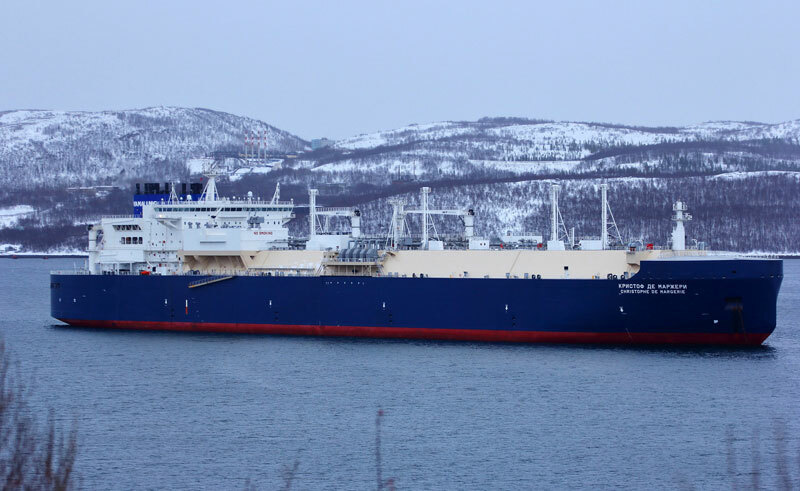 After ice testing in the northern Kara Sea, LNG tanker «Christophe de Margerie» for the first time enters Russia’s new grand Arctic port of Sabetta. 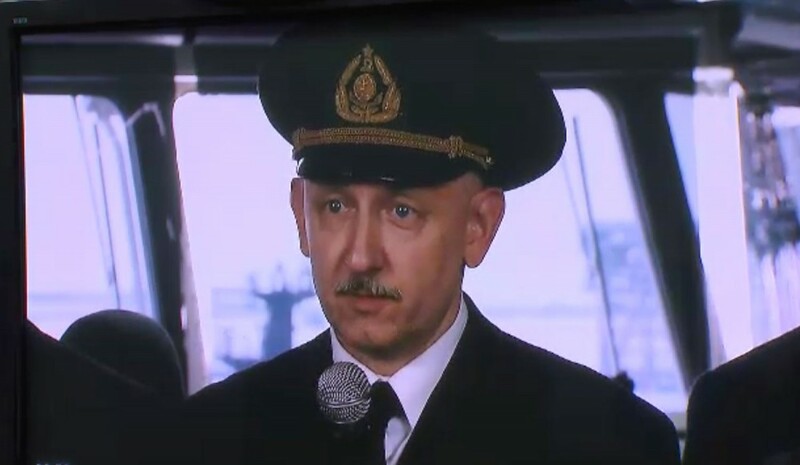 On a direct video link from his ship, Captain Sergey Zybko on Thursday reported to the President that the tanker with its crew of 29 men had successfully docked in the icy waters of the Sabetta port. «There were no incidents with the ship during its sailing through the Northern Sea Route and the Gulf of Ob», Zybko underlined, a transcript published by the Kremlin reads. «The ship is technically faultless, the crew is healthy and the vessel has shown its high level of performance in ice, it is ready for year-round navigation and shipping of gas from Sabetta». The «Christophe de Margerie» entered Sabetta on 28th March, 9 pm local time. Before that, it had undergone major testing in the region. On 10th February, the ship entered into the Russian part of the Barents Sea and subsequently set course for the northern Parts of the Kara Sea. During its voyage, the tanker criss-crossed through the region and also made it into the Laptev Sea. The «Christophe de Margerie» is the first in a fleet of 15 tankers of the kind built to serve the Yamal LNG. The project operated by Novatek will already in 2018 reach it annual target production of 16,5 million tons of LNG, company representatives say. Not only Novatek and its project partners have invested heavily in the project. Also the federal government has injected big sums into the Arctic infrastructure. A total of 108 billion rubles have been invested, of 72 billions from the federal budget, Transport Minister Mikhail Sokolov said in the ceremony. Part of the project is a 50 km long, 300 meter wide and 15 meter deep canal built from the Gulf of Ob to the terminal facilities located on the northeastern shore of the Yamal Peninsula. «The port is practically fully operational», Minister Solokov underlined in the televised meeting with Putin. «Last year, about 1,200 ships of different classes entered the port with about 3 million tons of goods», he added. «I want to thank you all», Putin told the participants in the ceremony. «if we continue in this same way and with this speed […] then without doubt Russia will become the world’s biggest producer of LNG».